How else does a girl from Brisbane wind up in Whistler? 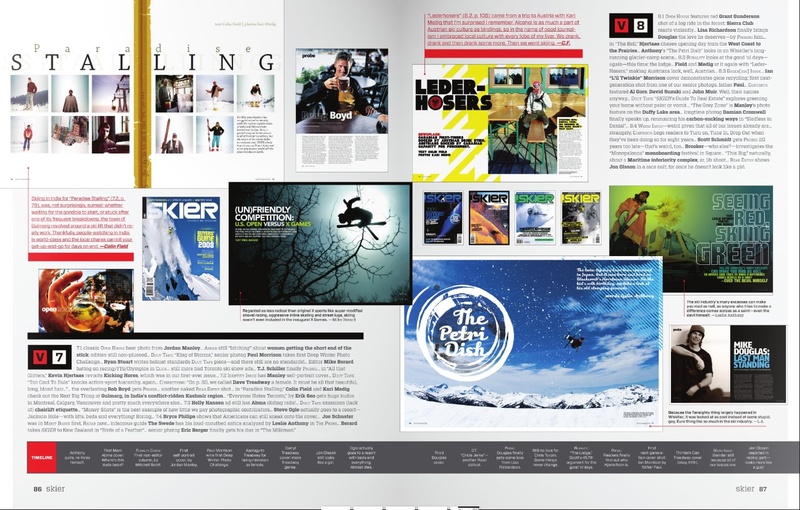 So, high-fives SBC Skier, on the event of your 10th anniversary – no mean feat considering the carnage of abandoned ski publications that litter the highways to the hills. (RIP: Freeze, Boards in Motion, Axis, Ski Press and Skiing.) You covered bold terrain: banning use of the word “progression” (so interviews with athletes had 75% of the content bleeped out), liberally endorsing hoserdom, (which infused the book with genuine Can-con that made its humour impenetrable to anyone south of the 49th), and running editorials and features dosed with irony and wit that it would seem you actually believe skiers (and hosers) have some critical thinking skills. I’ve had the chance to create a few wormholes in the universe with SBC Skier – probing Mike Douglas, the applicability of Malcolm Gladwell’s Outliers thesis to TJ Schiller and the Vernon crew, and the gnarly world of freeski events… And if any of those tears in the fabric of the cosmos helped a snow-sick kid sitting in the suburbs find their way to germ-infested share accommodation in a ski-town somewhere, then I have paid it forward. And so the bull-wheel turns, with many happy returns.